Turn off the camera and remove the cap that covers the lens mount on the front of the camera. Hold the lens in front of the camera so that the little white dot on the lens aligns with the matching dot on the camera body. Official photography lingo uses the term mounting index instead of little white dot. Either way, you can see the markings in question in this figure. When attaching the lens, rotate it in the direction indicated by the arrow. This figure shows the D5200 with its 18–55mm kit lens. If you buy a different lens, check your lens manual for complete operating instructions. The mounting index on your lens may not look the same as the one featured in this figure. When you do so, grip the lens by its back collar, not the movable, forward end of the lens barrel. Turn the lens in a counterclockwise direction until the lens clicks into place. To put it another way, turn the lens toward the side of the camera that sports the shutter button, as indicated by the red arrow in the figure. On a lens that has an aperture ring, set and lock the ring so the aperture is set at the highest f-stop number. 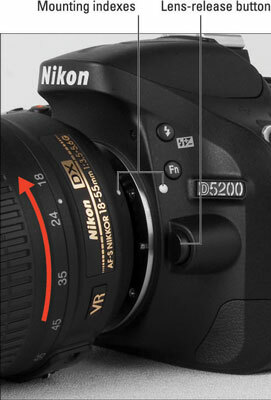 Check your lens manual to find out whether your lens sports an aperture ring and how to adjust it. (The 18–55mm and 18–105mm kit lenses don’t have this feature.) After locking the aperture on the lens, use the normal camera controls to adjust the f-stop setting. To remove a lens, press the lens-release button, labeled in the figure, and then turn the lens toward that button — that is, the opposite of what the arrow indicates in the figure — until it detaches from the lens mount. Put the rear protective cap onto the back of the lens and, if you aren’t putting another lens on the camera, cover the lens mount with its protective cap, too. Always attach or switch lenses in a clean environment to reduce the risk of getting dust, dirt, and other contaminants inside the camera or lens. Changing lenses on a sandy beach, for example, isn’t a good idea. For added safety, point the camera body slightly down when performing this maneuver; doing so helps prevent any flotsam in the air from being drawn into the camera by gravity.